MOSCOW (Reuters) - The Kremlin may have spent years reviling America, but Russians hoping Donald Trump will usher in a new era of detente marked his inauguration on Friday with parties and trinkets from commemorative coins to "matryoshka" nesting dolls in his image. Washington was turned into a virtual fortress with an estimated 900,000 people -- backers and protesters -- descending on the capital. In London, anti-Trump activists draped a banner reading "Build Bridges Not Walls" from Tower Bridge. Protests were planned across western Europe on Friday and Saturday. 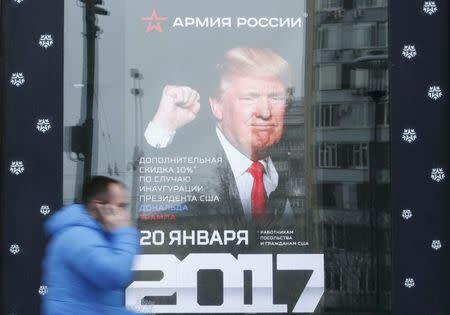 But according to Gennady Gudkov, a Putin critic and former lawmaker, Russia is in the grip of "Trumpomania", with state media giving the President-elect blanket air time at the expense of more mundane and sometimes depressing domestic news stories. That, he said, was in part because the U.S. election, unlike elections in Russia, had been unpredictable. The Kremlin is hoping Trump will ease sanctions imposed over the annexation of Crimea, team up with Russia against Islamic State, and cut back NATO military activity near Russian borders. Craftsmen in the city of Zlatoust, east of Moscow, have released a limited series of silver and gold commemorative coins, engraved with "In Trump We Trust" - an allusion to the phrase on U.S. banknotes "In God We Trust". 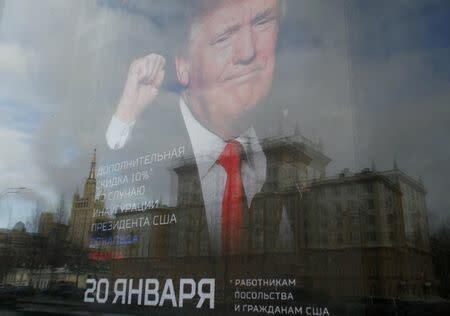 And a shop selling Russian military kit located opposite the U.S. embassy in Moscow has unveiled a cheeky promotional campaign offering embassy employees and U.S. citizens a 10 percent discount on its wares to celebrate Trump's inauguration. Some of Trump's opponents believe the Kremlin helped him win the White House by staging a hacking campaign to hoover up embarrassing information about Hillary Clinton, his rival. The Kremlin denies that, but few here make any secret of the fact that they are pleased that Trump and not Clinton triumphed. Relations between Putin and Barack Obama had soured badly. "Trump's election has generated enormous enthusiasm in Russia because his warm words about Russia and Putin have given us hope that the USA and the West will stop their attack on Russia," Sergei Markov, a former pro-Putin lawmaker, said on social media. "We don't know for sure if there will be an improvement (in relations) or not. But we Russians are optimists ... so we are hoping for the best, while preparing for the worst." For Russian nationalists, Trump's inauguration is an excuse to mix fun with self-promotion. They are holding an all-night party at what used to be the main Soviet-era post office in Moscow where they will showcase their favorite prop, a triptych of Putin, Trump and French Front National leader Marine Le Pen. Konstantin Rykov, a former pro-Putin lawmaker and one of the event's promoters, said on social media it was right to celebrate the first phase of the "New World Order." "Washington will be ours," he quipped.